18 years ago Linda Koebner was a part of a program that focused on getting several lab chimps reintroduced to the wild. 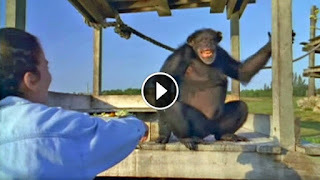 During her work she befriended Doll and Swing, two chimpanzees who were locked for years in cold cages before seeing the sun or touching the grass again. 18 years have passed since then and on this day, Linda decided to pay a visit to her old friends and see if they would remember her. The resulting emotional footage became the award winning film Wisdom of the Wild and it's going to make you tear up. This post was republished from why dont you try this. You can find the original post here.